We are a leading Manufacturer of electromagnetic separators, self cleaning electromagnetic(obms) separator, wet magnetic drum separators, wet drum magnetic separators, electromagnetic separator and bullet magnets from New Delhi, India. 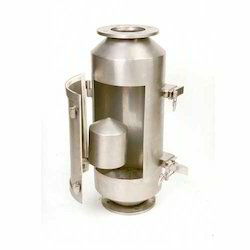 We are among the prominent manufacturers and exporters of Electromagnetic Separators. These are widely utilized for removing large tramp metal contamination from a flow of materials. These comprise of a powerful magnet that has a long functional life. These magnets are functional as long as the power is switched on. Therefore, for cleaning them, the power source must be turned off for them to drop the ferrous material thus extracted. As the product on a conveyor belt flows under the powerful magnetic field, ferrous material is pulled out of the product flow and held to the face of the magnet. When using a Manual-Clean model, the collected tramp metal is held in place for as the unit has power. In order to clean the unit, the power source must simply be turned off, which instantly releases the metal from the magnets hold. With Self-Cleaning models, continuous cleaning is made possible by a heavy duty clad belt that encircles the magnet on a series of rotating pulleys. 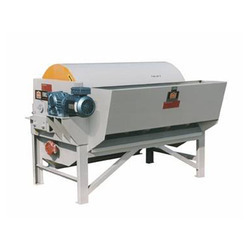 Self Cleaning Electromagnetic(OBMS) Separator are designed for separation of ferrous metal from a variety of over the belt conveyor applications.They are successfully remove damaging tramp metal from flow of coal, limestone, sand, gravel, wood products, recycled materials and almost any conveyed non ferrous material. 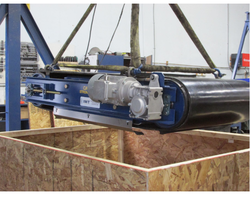 Installation options include In Line and Cross Belt configurations to meet the specific needs of your application. Operations :- As the product on a conveyor belt flows under the powerful magnetic field, ferrous material is pulled out of the product flow and held to the face of the magnet. When using a Manual Clean model, the collected tramp metal is held in place for as the unit has power. In order to clean the unit, the power source must simply be turned off, which instantly releases the metal from the magnets hold. With Self Cleaning models, continuous cleaning is made possible by a heavy duty clad belt that encircles the magnet on a series of rotating pulleys. As ferrous metal is attracted and held by the magnet, the moving belt carries the collected metal outside of the magnetic field where it is then released beyond the product flow. Online Magnetic Separator is an efficient, cost effective magnet for extracting ferrous metal particles from free flowing granular products. Designed for installation in pipelines or ductwork, as material flows over the magnetic bullet, any ferrous particles are attracted to the highly magnetic surface and securely held in position. 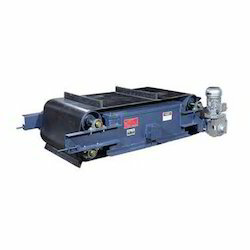 With our years of experience & in-depth knowledge in this field, we are engaged in offering a quality-assured array Wet Drum Magnetic Separators. Electromagnetic Separators use wire coils and direct current to provide a magnetic field which can be used to separate ferrous material from non ferrous products.Electromagnetic separators are available in a wide variety of type. The Bullet Magnet is an efficient as well as cost-effective device for extracting iron particles from free-flowing granular products. 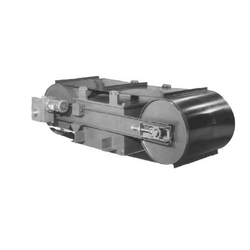 It is designed for installation in pipelines or ducted systems, as material flows over the Magnetic Bullet, any ferrous particles is attracted to the highly magnetic surface and securely held in position. Ferrous metals are magnetically pulled out of your non-ferrous conveyed materials; ferrous materials collect on the self cleaning magnetic separator belt and are conveyed and discharged to your hopper. 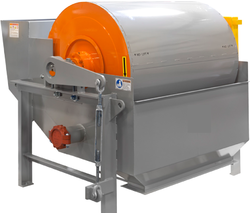 Automatically remove large tramp metal contamination from product flows on conveyors belts or vibratory feeders to product processing equipment and improve product purity. Looking for Electromagnetic Separator ?